The Home Affordable Refinance Program (HARP) stands out as one of the Obama administration’s most successful interventions to help borrowers hit by the housing market crash. The program is aimed at borrowers who took out mortgages backed by Fannie Mae and Freddie Mac (the GSEs) prior to June 1, 2009, and enables them to refinance their loans even if the loans did not meet the GSEs’ normal requirements for refinancing. Since 2009, HARP has allowed over 3 million homeowners to refinance their mortgages, securing lower monthly payments. Given this success, senior US Treasury official Michael Stegman’s declaration in a speech last week that there would be no extension of the cutoff date limiting the program’s reach came as a surprise to many. In the Housing Finance Policy Center’s January edition of our monthly chartbook (page 24), we investigated a key claim behind Stegman’s statement: that extending the June 2009 cutoff date—loans made after that date cannot qualify for HARP—would affect a small number of borrowers. To determine how many borrowers would potentially benefit from a later cutoff date, we took a look at the other requirements for HARP eligibility. First, a borrower must have a record of making their payments on time: no late payments in the past six months, and no more than one late payment in the past year. Second, the homeowner must have limited equity in the home, with the marked-to-market loan-to-value (LTV) ratio (the ratio of the unpaid mortgage balance to the current market value of the house) above 80 percent. Finally, the loan must be “in the money,” meaning that the refinance would be economical for the borrower—that is, the current interest rate must be enough lower than the rate the borrower is paying to cover the costs of the refinancing. 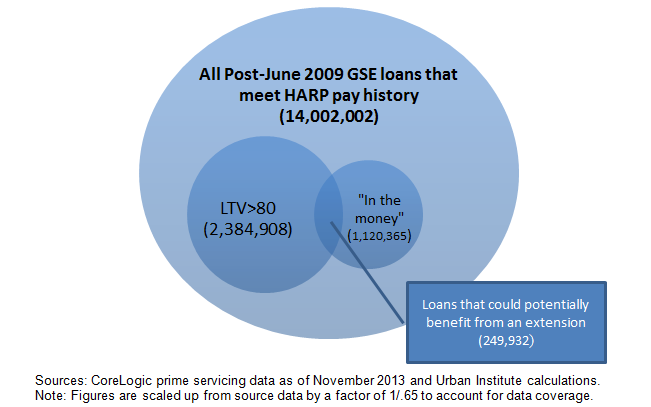 The chart above sorts the universe of GSE loans by these HARP eligibility rules. Out of approximately 25 million active Freddie and Fannie loans, there are 14 million originated after the cut-off date that meet the pay history requirement. That seems like a large number that could potentially benefit from a change in the cutoff, but only about 2.4 million of these meet the LTV ratio minimum of 80 percent, because since 2009, well over half of the loans purchased by the GSEs have been refinances, and most of those have LTVs under 80 percent. Of those 2.4 million, only 11 percent (249,932; see the tiny overlap in the middle of the chart) are “in the money.” Why so few? Because post-June 2009 borrowers took out their mortgages at a time of historically low interest rates, making it unlikely that they could obtain a lower rate today. And some of these borrowers HARPed once, early in the process, and the rules prohibit them from a further HARP refinance. When we further divided the group of 249,932 who could potentially benefit from an extension by their origination dates, we tallied 113,998 borrowers that could benefit from a one-year extension of the cut-off date, and 200,632 that could benefit from a two-year extension. These numbers are dwarfed by the 846,677 pre-June 2009 borrowers that remain eligible without an extension, and over 3 million who have already benefited from a HARP refinance. There has been little question of HARP’s effectiveness in providing relief to homeowners since the housing crisis, but Stegman is correct that tweaking the cutoff date will do little to extend the program’s reach. Thanks for not helping the working class man who has been paying his or her mortgage through the recession and still cannot get a break. Low interest rates did not start until 2010 and as such how can it be assumed that if 100-200,000 benefiting from the from the program is not worth the change. I pay 5.375%.... If I was able to drop 1% of my loan, that would be a significant savings and also could possibly change to 15 year term . Thanks for assisting the working class who is very responsible.